One of the best wine scenes I’ve ever come across – other than the classic “I’m not drinking f*cking Merlot” line in Sideways – is the last supper in Of Gods and Men. The monks share red wine to the accompaniment of Tchaikovsky’s Grand Theme from Swan Lake, playing on an old tape machine in the corner. Xavier Beauvois’s camera does nothing but pan slowly around the table while this happens, minutely watching these men’s careworn faces as they absorb the mystery of their own deaths. It is pure poetry, and emphasises that intricate relationship between wine and classical music. Perhaps if any classical song was to match Tchaikovsky’s work in stature it would be that of Puccini’s Nessun dorma from act three of his great opera, which inspired La Boheme Act Three Pinot Gris And Friends as the diva Pinot Gris is joined by three other voices in the shape of the very aromatic and perfumed varieties, Riesling, Gewurztraminer and Pinot Blanc. 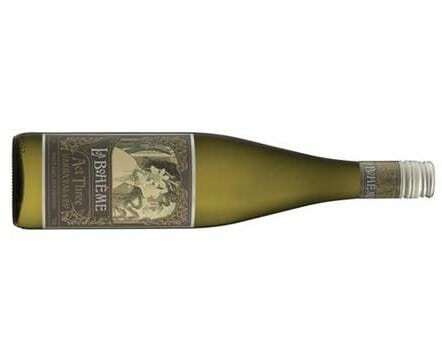 This is a clever wine in many ways, taking the popular Pinot Gris/Grigio and giving it quite a serious treatment with partial oak ageing, and stirring on the lees (the yeast that is left in a wine just after fermentation) to add a little gravitas, but then blending it with small proportions of those aromatic varieties to lift the bouquet and add lovely sweet, fresh fruitiness too. Some floral, green apple and honey aromas can be spotted on the nose backed by a subtle oakiness Apple on the taste. It is a lean wine but nicely balanced with a crisp acidity. Drink with cooked seafood such as seafood pastas and salads, grilled prawns, fish and chips or scallops. It would suite vegetarian dishes too such as roast pumpkin with goat’s cheese or vegetarian pastas.